It was not until we had a jam-packed hall of 50+ changemakers seated in front of us, each one with decades of experience managing complex portfolios and building global brands, poised to redefine traditional ways and spark the next big thing in Facilities Management, did we realise in full effect that – FUTUREPROOF HAS ARRIVED and to a great enthusiasm and fanfare from the industry! 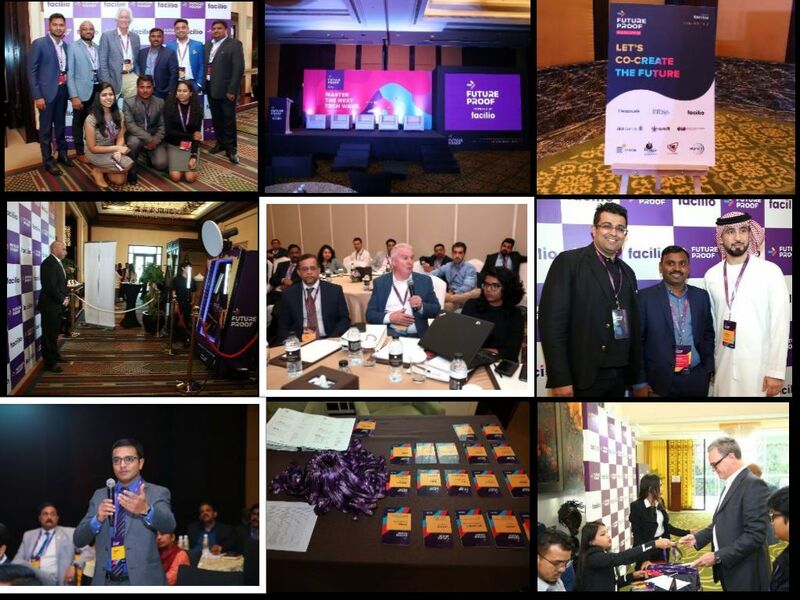 We’re super excited that the first ever Futureproof event that happened back to back in two cities of innovation – Bengaluru and Dubai – was a massive success! And for that, we owe a big THANK YOU to the wonderful Facilities Management community for being such a sport – top leaders coming together to share their secrets of success, learn from each others’ mistakes and co-create the future of facilities playbook is no mean feat! 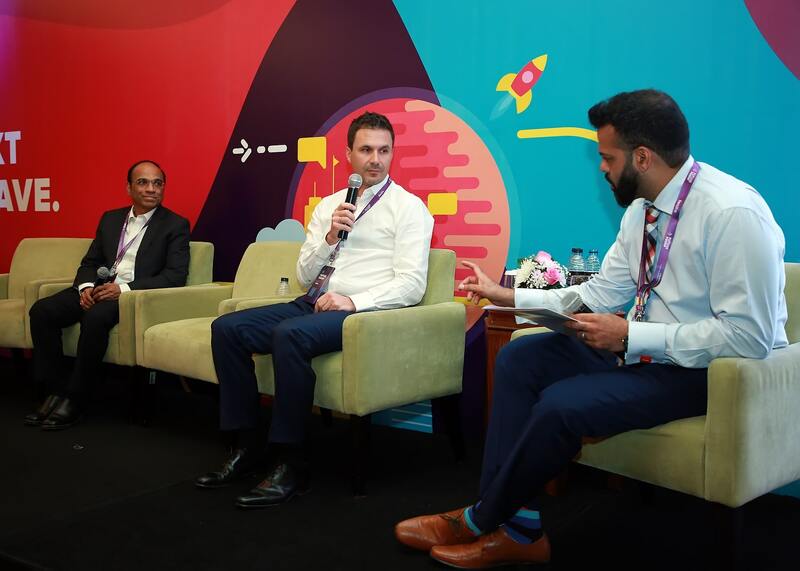 When our founder and CEO Prabhu Ramachandran, kicked off the event, he reiterated what we have been seeing and experiencing for the past decade – a shift in how every business works towards delivering the best experience for the customers. He drew parallel to the recent tech-driven disruptions in markets such as cab booking (Uber), food delivery (Swiggy), stay rentals (Airbnb), (net/mobile) banking all of which redefined our everyday lives by providing real-time services. Similarly, the FM industry, that impacts our emotions, experience and productivity in the spaces we live/work/occupy, is at the cusp of digital transformation. 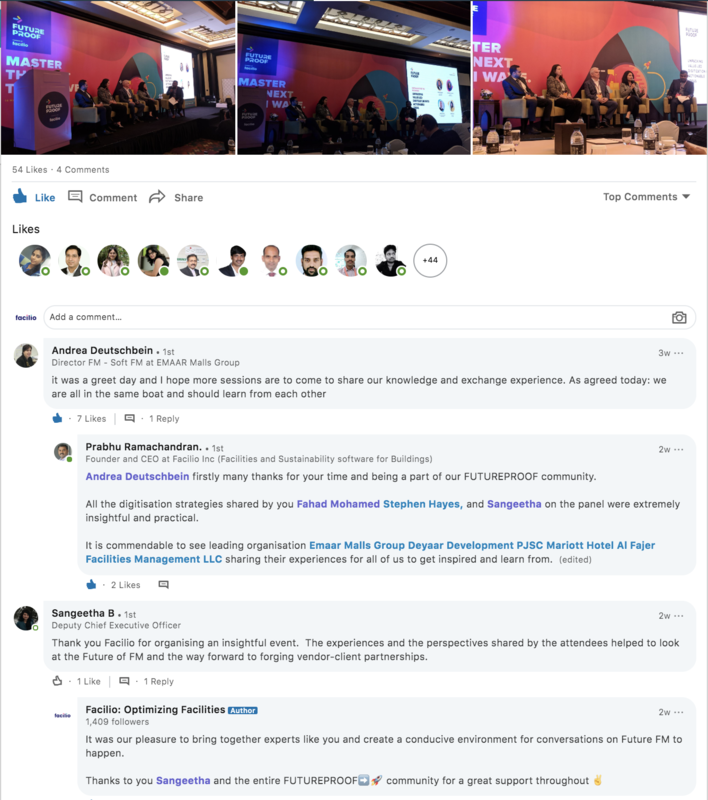 A forum like Futureproof, Prabhu said, is the first big step for the FM community to collectively shape the future of real-time facilities experience and the audience couldn’t agree more. If global brands are feeling this way, it’s time we redefine how we look at facilities management in our organisations as well, don’t you think? 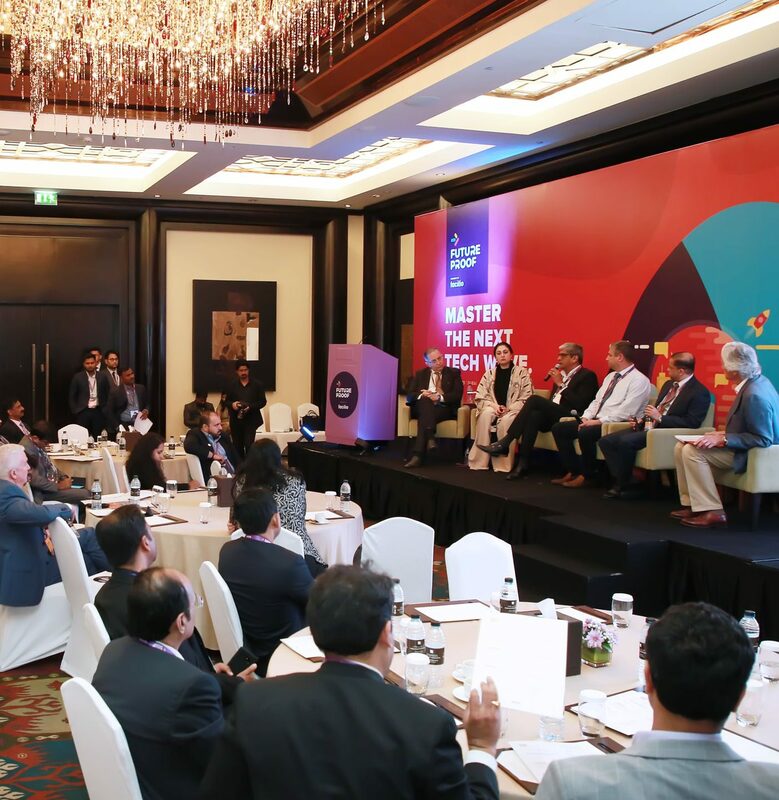 In a room full of facility professionals with varied experience, there were differences in standards being met, protocols being used, technologies being adopted but the entire room agreed in unison to one thing – scaling maintenance and management of complex buildings is not a child’s play. “Scaling operations has been our biggest challenge”, explained Khalid Shaban, Director Facilities, Dubai Silicon Oasis. FM technologies, are you taking notes already? It was interesting to hear first hand experiences from top CRE players like Al Wasl, Prestige group, Brigade group, Deyaar properties etc. and hear them discuss practical difficulties from using multiple siloed solutions to manage their large and dynamic portfolios. “Most existing solutions today, including CAFM, CMMS, EMS etc. are either repurposed industrial solutions or out-dated systems working in silos, only at the individual building level. These solutions do not work in tandem and pull down efficiency of people and buildings”, explained Sangeetha, Director CEO, Al Fajer FM. But guess what was even more interesting? The talk of the new category in town – a strong need for an enterprise-wide facilities optimisation platform to efficiently run their facilities operations centrally across their portfolio. Think of it as an integrated suite – facilities operations + asset maintenance + sustainability – tailor made for buildings. 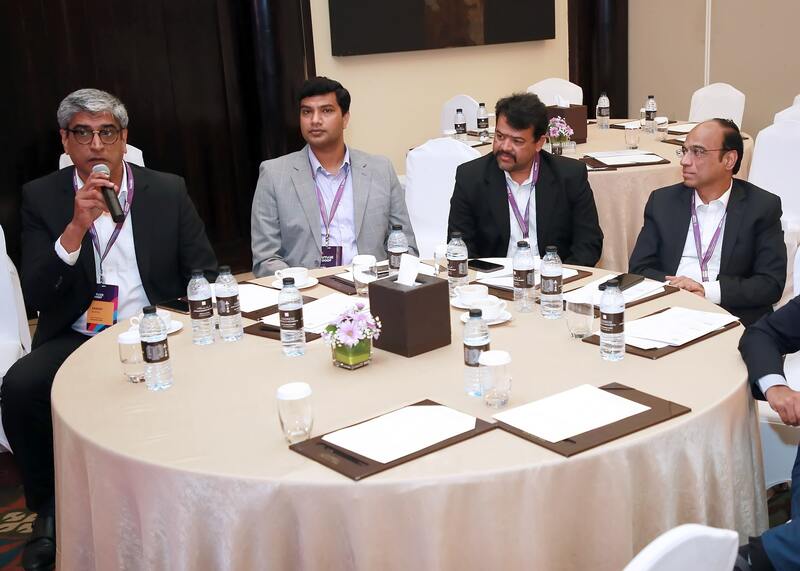 When the need to have more than just CaFM (or other incumbent traditional systems) in order to achieve sustainable efficiency at scale was discussed, the facilities fraternity gave a huge nod. There was no denying that most buildings have already invested a lot of money, time and effort into installing an extensive automation infrastructure. However, the plight of data collected from these automation systems never reaching everyday facility workflows remains to be a huge gap, still unaddressed by many solutions. With the age-old expectation from FMs to achieve more with less, there is always a pressure to show ROI on optimisation. Global brands Infosys, Wipro, Marriott International, Emaar etc. 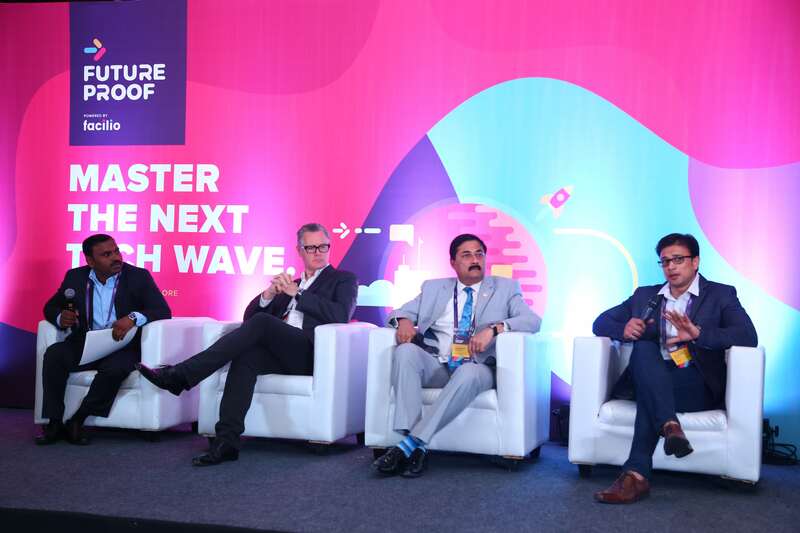 explained that the smartest way to do this is to set shorter goals, start optimising small, show measurable ROI in terms of workforce efficiency, reduced bill shocks and customer complaints and then scale to other buildings in the portfolio. This could include low hanging fruits like enabling data from automation to deliver real-time experiences, optimise performance in a single building, digitise paper-based processes with automated systems etc. 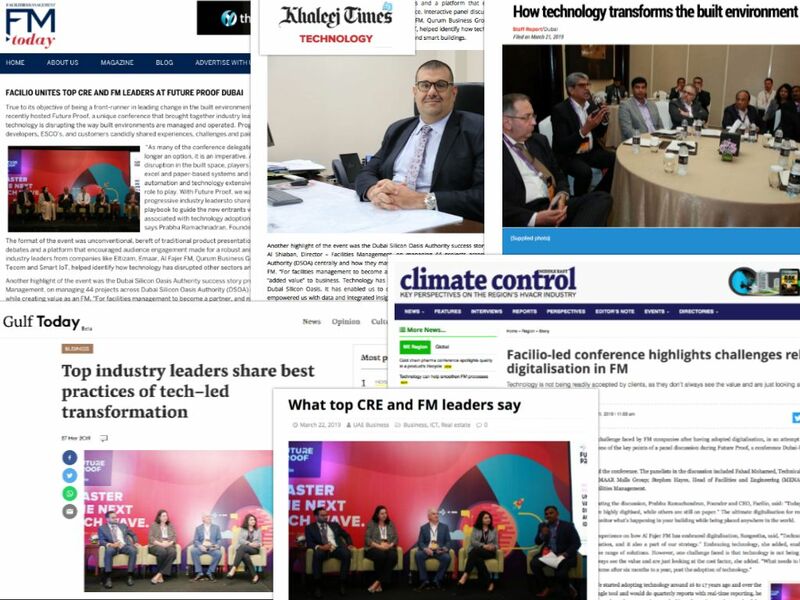 From Emaar to RMZ to Dubai Sports City to WTC Bangalore, all top leadership wanted to fast track the development of more open and connected systems and felt it was high time they are in the driver seat of their portfolios with complete visibility into the operations, performance, energy spend and cost insights from a single central place. Collecting and owning relevant data across portfolio opens myriad opportunities to optimise at every step and every fuel consumed. 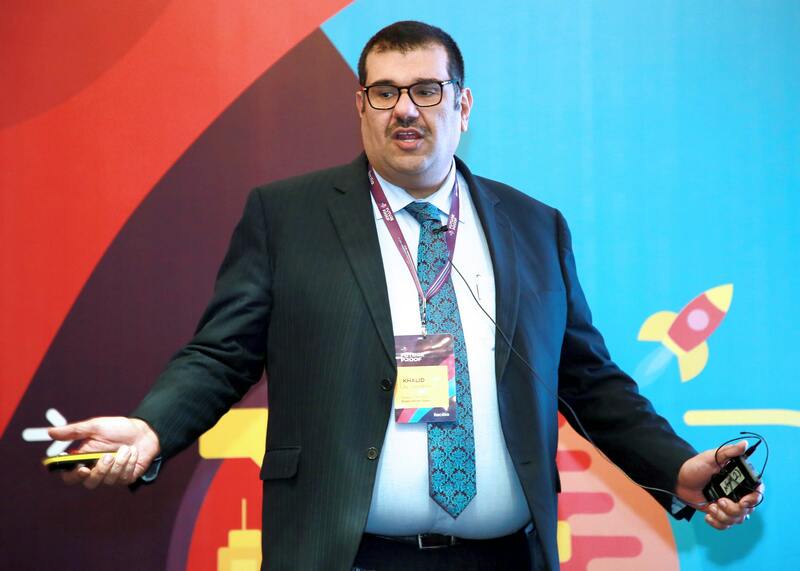 “With data-driven insights, we can integrate sustainability with everyday facility workflows and pave way for sustainability everyday”, an excited Firas Obeido, CTO, Smart AE said how digital retrofits helped them guarantee consistent energy savings for their customers. 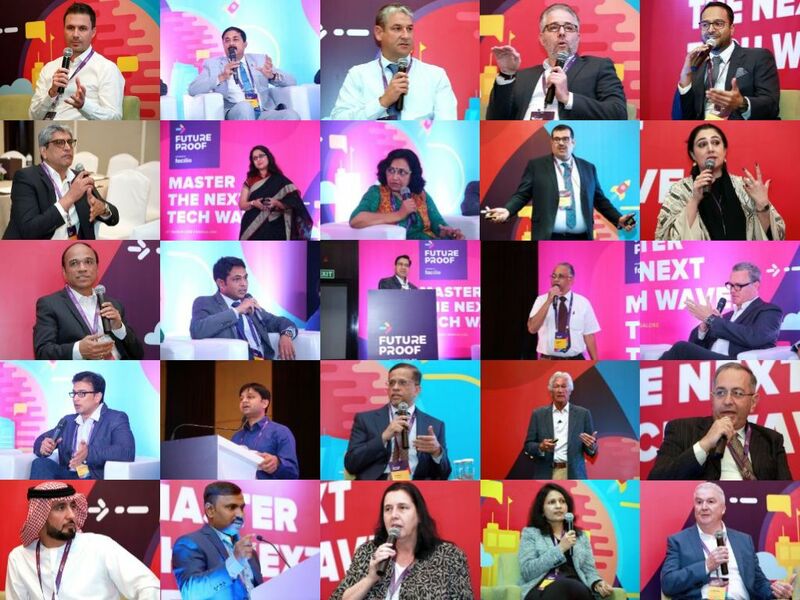 In essence, Futureproof brought together a spectrum of people who were eager to share their learnings and experiences with the industry at large to help all of us move forward to the next era of real-time facilities experience. The unconventional format of the event, frank exchanges within the community and the willingness of the ecosystem to drive the change has set the ball rolling for what will become an amazing community that would co-create the FUTURE! PS: Futureproof was all over the news, no surprise there! You could catch the glimpses right here! 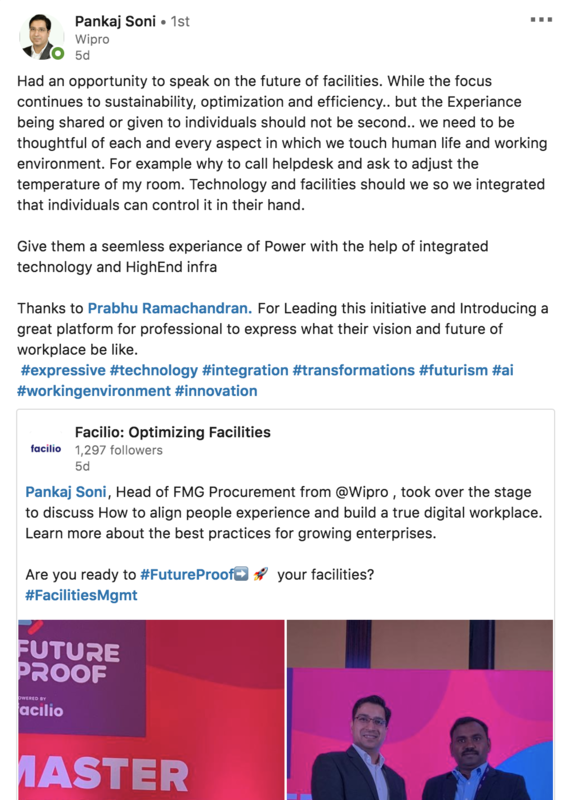 If you thought your peers would love to learn these insights, make sure to share this post and your thoughts on #FUTUREPROOF on LinkedIn and Twitter! We’d love to see them. At Facilio, we’re continuously rethinking the way buildings are managed – shifting traditional, tactical facilities management towards smarter, predictive facilities experience. We’re on a mission to help the built environment thrive towards continuous sustainability by empowering people, machines, and buildings achieve high levels of efficiency. Get started with Facilio here.